At Hotel Daumesnil-Vincennes, enjoy the close proximity to your business meeting and all the major tourist attractions of Paris while relaxing in a pleasant and comfortable setting. In a cozy Provençal-style atmosphere, enjoy our rooms in complete autonomy where you will find modern facilities, great conveniences and high quality 3-star hotel services. The 49 rooms are soundproof and air conditioned and are equipped with a 3'' Ambilight flat screen TV with Canal+ and satellite channels, free and secure Wi-Fi, a private bathroom with shower or bath, a safe, a minibar, trouser press... With their office area, the rooms are also perfect for business trips. For families: Children under 12 stay for free when they share a room with their parents! Don’t miss this great opportunity! Possibility to rent a crib or folding bed. Childcare services are also available. Standard single room : 11 m², bathroom with shower. The single rooms invite you to relax in front of a beautiful view of the hotel patio. Standard double room: 13 m², bathroom with shower. Some of these rooms have a view of the patio while others can be changed into triple rooms. Exclusive double room : 13 m², bathroom with bathtub. Some of these rooms have a view of the patio while others can be changed into triple rooms. Executive twin room : 13 m², bathroom with shower. Comfortably enjoy our Executive room in complete autonomy with 2 high quality twin beds. Executive double room : 14 m², bathroom with shower. In the Executive double room, stay near Paris in style with a king size bed, air conditioning and all the comforts necessary for you to relax. Prestige room (family): 18 m², bathroom with shower. These rooms are specifically designed to accommodate up to four people. iPod docking station, courtesy tray with free tea and coffee. For holidays, an escapade or a business stay, the location of the hotel Daumesnil-Vincennes is ideal! 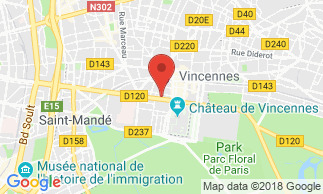 You will be 50 meters away from a subway station which takes you in the wink of an eye everywhere in Paris either to only 100 meters of the castle of Vincennes, one of the most beautiful French medieval fortified castles. Placed 100 meters away from the Castle of Vincennes, famous medieval fortress with the impressing donjon, the Daumesnil-Vincennes hotel allows you to be in the edge of the wood of Vincennes and nevertheless close to all the businesses, the restaurants, the bars and the animations of the city centre of Vincennes. But if it is also Paris which attracts you, meet up 50 meters on foot from your hotel! There a subway waits for you to take you where you wish in Paris. In 20 minutes you will be on the Champs-Elysées, the most beautiful avenue of the World, either still in the Defense, the business district of Paris … The Bastille and its animation night bird as The Louvre and its patrimonial treasures are also directly accessible by the subway line! is served from 6:30 am to 10:30 am. On request: a continental breakfast can be served in your room. Breakfast is not included in the room rate: 14 EUR per person.